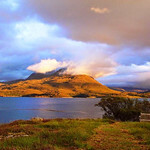 Torridon has perhaps the most striking skyline in the Scottish Highlands. The straggly little village of Torrindon makes the ideal base from which to tackle the mountains here. The multi-peaked mountains of Beinn Alligin, Liathach (pronounced 'Lee-ahakh') and Beinn Eighe ('Ben-eay') form a massive fortress of turrets, spires and pinnacles that provides an awesome backdrop to Loch Torridon, as well as the most exhilarating walking and climbing on the Scottish mainland. The coast road from Applecross meets the A896 from Lochcarron at the lovely little village of Shieldaig on the southern shore of Loch Torridon. There's a shop, a post office, a campsite, a couple of B&Bs and the B Tigh-an-Eilean Hotel, Tel. 01520-755251, where you can get reasonable meals. Several miles east, a side road turns off the A896 by Torridon village and winds its way along the northern shore of the loch, then climbs through dramatic scenery before dropping to the beautiful little village of Diabaig (pronounced 'Jee-a-beg'), 10 miles from Torridon village. It's a worthwhile side trip, as the views across to the Applecross peninsula and Raasay are fantastic. There's also a great seven-mile coastal walk from Diabaig to Redpoint. 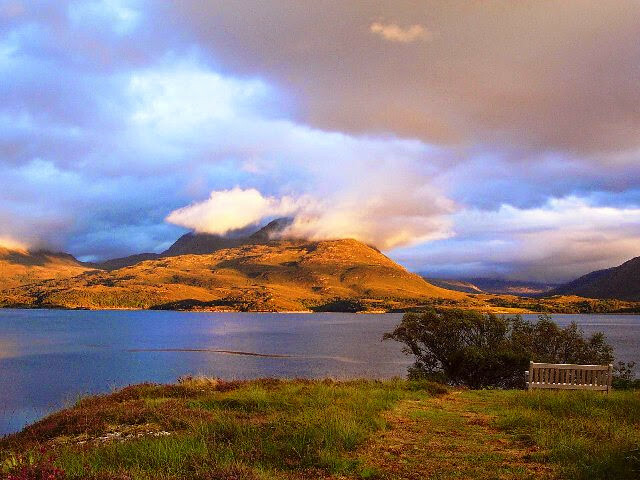 Much of the Torridon massif is in the care of the National Trust for Scotland, and just before Torridon village is the NTS countryside centre, Tel. 791221, where you can get information and advice on walks in the area, as well as books and maps. About 400 yards past the centre is the Deer Museum, which has a small display describing the management of red deer in the Highlands as well as some live specimens outside. The Postbus from Applecross to Shieldaig continues to Torridon village (see above). There's a postbus from Strathcarron station at 0955 which arrives in Shieldaig at 1040. Duncan Maclennan buses (Tel. 01520-755239) have a service which leaves Strathcarron at 1230 and arrives in Torridon at 1330 (daily except Sun). There's also a daily (Mon-Sat) Postbus service from Diabaig to Kinlochewe and Achnasheen, via Torridon, at 0955. 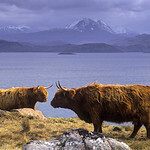 There are also Duncan Maclennan buses between Torridon and Shieldaig and Strathcarron. Torridon offers some of the most spectacular walking on the Scottish mainland but also presents some of the most serious challenges. You need to be fit, experienced and well prepared and also be aware of the notoriously unpredictable weather. You should have a compass and the relevant map. Beinn Eighe (3,309 ft) has nine peaks and is the largest of the Torridon mountains. To traverse its ridge is a mighty undertaking and can take two days. A much shorter and easier walk around the base of the mountain is described below, under Beinn Eighe National Nature Reserve. For those who are not experienced hill walkers, there's a Ranger Service for visitors. During July and August the ranger, Seamus McNally, takes guided walks up into the mountains three times a week. For more details call, Tel. 791221. A recommended local mountain guide is Steve Chadwick, Tel. 712455. 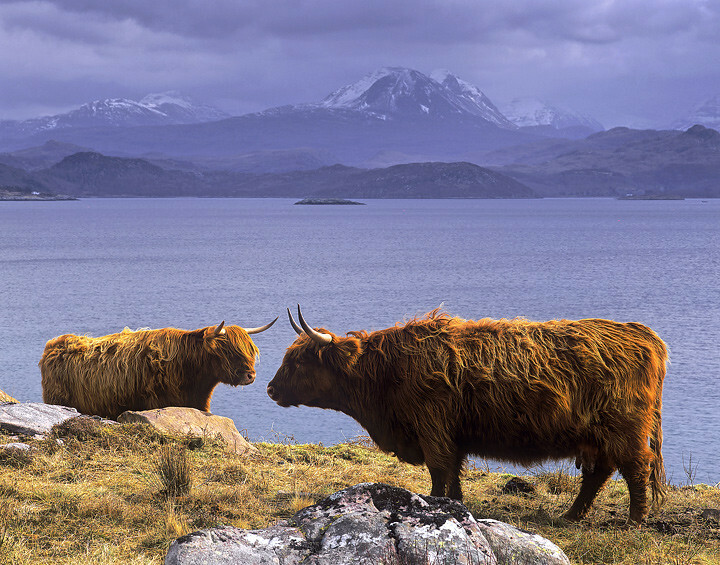 Scotland's first national nature reserve and and home to a wonderful variety of local wildlife. For visitors who would like to find out more about Beinn Eighe, there’s a visitor centre open from Easter to October just outside Kinlochewe. The three trails which start here are open all year and a further path links the visitor centre with the village of Kinlochewe. The visitor centre has a small shop area with tourist information and a shop selling books and products about nature. About a mile south of the turn-off to Torridon village is the magnificent Loch Torridon Hotel, Tel. 791242, Fax. 791296, www.lochtorridonhotel.com 19 ensuite rooms. Open all year. This fairytale Gothic pile sits on the lochside surrounded by majestic mountains and offers the ultimate in style and comfort. It also boasts one of the finest restaurants in the area (expensive). There are several B&Bs, including the excellent Upper Diabaig Farm, Tel. 790227, open Apr-Sep, in Upper Diabaig. There are also a couple of SYHA hostels. One is in Torridon village, Tel. 791284, open 29 Jan-31 Oct, with an adjacent campsite. The other is much smaller and more basic, 4 miles north of Diabaig on the trail to Redpoint, at the disused crofting township of Craig (no phone; open 14 May-3 Oct).